Bidets are becoming more and more popular in the U.S., especially the bidet toilet seat. They replace your existing toilet seat and usually have all the features of a stand-alone bidet. They typically offer a heated seat, water heating system, adjustable sprays, and more. But what if that appliance is too expensive, or if you don't need all those bells and whistles? Then, you can just opt for a bidet attachment instead. A bidet attachment offers a similar spray wand and, often, the same kind of controls as a stand-alone bidet or bidet toilet seat. But they’re smaller and fit between the existing toilet and toilet seat rather than replacing the existing seat. They usually provide fewer features, though. They mostly lack the ability to warm the toilet seat, for example. They also generally don’t house a warm air dryer, deodorizer, and other features common to a bidet seat. Because they offer most of the basic functions of a stand-alone bidet or bidet seat, a bidet attachment works just like the larger models. Like them, an attachment will provide a spray wand that cleans the posterior or feminine parts, or both. One of the few advantages of an attachment over a bidet seat (besides lower cost) is that they’re typically less restrictive when it comes to installation. All that’s needed is for the width of the rectangular installation holes to match the toilet seat, which they almost always do. One thing that helps along that “universality” is the fact that attachments require no electrical connection. Even if you’re not a skilled do-it-yourselfer in the bathroom, almost anyone can install a bidet attachment in far less than an hour, typically no more than a dozen minutes. You might need a screwdriver, but often not even that. You’ll need a wrench that fits your toilet’s water supply. Usually, an open-ended crescent wrench is best. Before you begin (before you even buy! )… make sure there’s enough space around your toilet and your toilet seat for what you plan to install. You start by simply removing the existing toilet seat usually by removing the plastic “wingnuts” underneath the toilet rim, near the back. Place the attachment and adjust the brackets until they line up with the holes in the toilet. Then reattach your toilet seat by screwing the toilet seat back on the attachment and the toilet. Tighten everything down, finger tight. Don’t over-tighten. Turn off the water supply to the toilet by turning the valve on the wall near the base of the toilet. Sometimes it’s under the sink. Drain out the water by flushing the toilet. Put some towels under the hose assembly to catch up any residual water when disconnecting the water connection hose from the toilet tank. Make sure the rubber washers are placed carefully into the supplied T-adapter. See your attachment’s installation manual for details. Then connect the T-adapter to the toilet tank’s fill valve and reconnect the water connection hose to the T-adapter. Finally connect the supplied bidet hose to the T-adapter and bidet inlet. Open the water supply again and flush the toilet, checking for leaks at the hose. Test your bidet. Done! Or… not entirely yet. Some bidet attachments like the Luxe Bidet Neo 320 or the FreshSpa FSW-20 by Brondell offer warm water for cleansing. They connect directly to your home’s hot water supply. Making that second connection is just as easy as hooking up the cold water hose. Just as with the cold water connection, turn off the valve that allows hot water to your bathroom faucet. That’s frequently inside a cabinet directly under the sink. Put some towels down beneath the hose coming off the valve to catch up any residual water. Next, use a crescent wrench to loosen the connection. Ensure that all rubber washers are inserted and flat into the supplied hot water T-adapter, then connect the T-adapter to the hot water shutoff valve and reconnect the hot water supply line to the T-adapter. Connect the hot water bidet hose to the T-adapter and hot water bidet inlet. Re-open the hot water valve slowly, looking for drips. If everything is sealed well, test your bidet. Of course, before you can install an attachment you have to buy one – and you want one that’s best for your family. Here are 5 potentially important features to consider. 1. Posterior or Feminine Wash, or… Both? 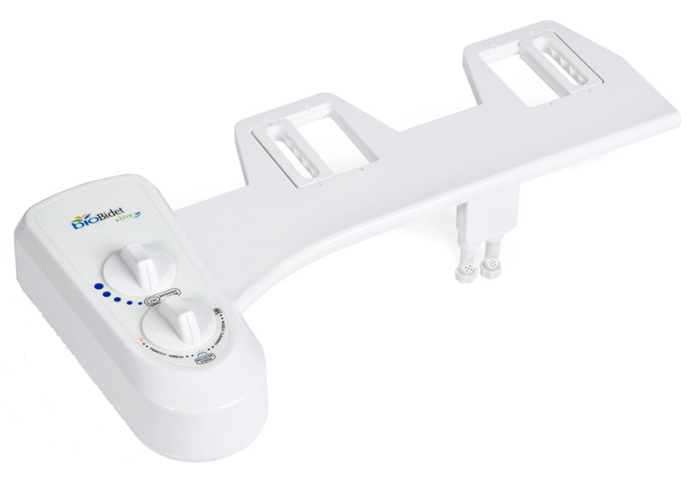 – Some attachment models offer a dual cleansing function provided by many bidet seats. That is, it can wash either posterior or feminine parts, or both. Frequently, a seat model will do that by housing dual nozzles. Sometimes, it’s done by a single nozzle with an adjustable angle or by letting you change the extension (length). Either way, if you want to satisfy all family members, this could be an important item for your wishlist. 2. Warm Water Connection & Temperature Adjustment? 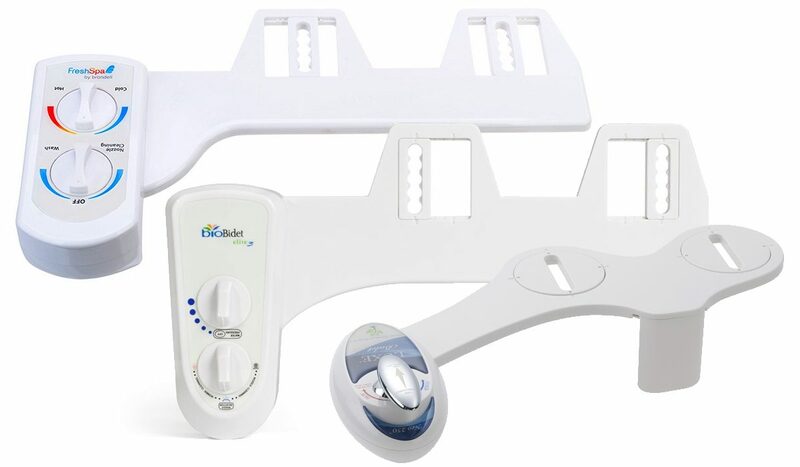 – You shouldn’t expect to get all the features of a high-end bidet seat in a bidet attachment. A heated seat, warm air dryer or deodorizer are very unlikely. Still, beyond a simple wand, some bidet attachments may offer a warm water hookup. If that’s an option in your bathroom, consider whether that’s important. It will cost you a premium. If there’s a warm water hookup, can the temperature be changed to suit individual preferences? For some buyers that can be a make or break item. 3. Water Pressure Adjustment? – Many bidet attachments offer pressure adjustment. Beyond satisfying individual desires, that can be an important feature for some bidet users. Anyone who’s suffering from hemorrhoids or had a recent operation might rate this feature as important. 4. Bidet Control Mechanism? – Most bidet attachments will have simplified controls in part because of the reduced number of features. Most will have a control panel integrated into the attachment itself. By contrast, several bidet seats offer a separate hand-held remote control unit. Before deciding which way to go – attachment or seat – ask yourself how important that is to you and your family. Keep in mind here in particular anyone in the house that has difficulty moving an arm back at an angle. They might also have trouble pressing stubborn buttons or turning stiff knobs. An electronic remote control – ie. a bidet seat model – might be a better solution for users in those situations. 5. Self-Cleaning Nozzles? – Don’t forget you’ll probably have to do some cleaning maintenance on your bidet attachment. A wand with a self-cleaning nozzle (engineered by a retracting wand or by spraying itself) can save you a lot of icky effort. Some even have a nozzle guard gate that “caps” the nozzle until it’s ready to be used. So, Which Bidet Attachment to Choose? Picking one best bidet attachment for everyone is, of course, impossible. But here is my personal top 3 pick. All 3 appliances offer reliability and great features at a modest price and are backed by dozens of positive verified customer reviews. For a “mere” bidet attachment, it’s a little surprising just how many features the Bio Bidet Elite3 provides. For example, it houses a self-cleaning dual nozzle system. That’s not unknown among attachments, but it does put this model in rare good company. That allows for feminine wash for the females in the house and posterior wash for the whole family. The self-cleaning aspect will, as recommended above, reduce the need for unpleasant maintenance efforts. It also features a pressure control, more common but still very welcome. The controls allow for an unusually high setting. That will be of particular help to those troubled by constipation. And, in this case, the pressure controls are a far better implementation than on many models that offer it. In part that’s down to fine materials, but it’s equally the result of good manufacturing quality. Evidence of that is found in the brass valve and inlet. That’s usually reserved for quality faucets. It’s less often used in modest-cost plumbing products, which more often use plastic or tin or copper. 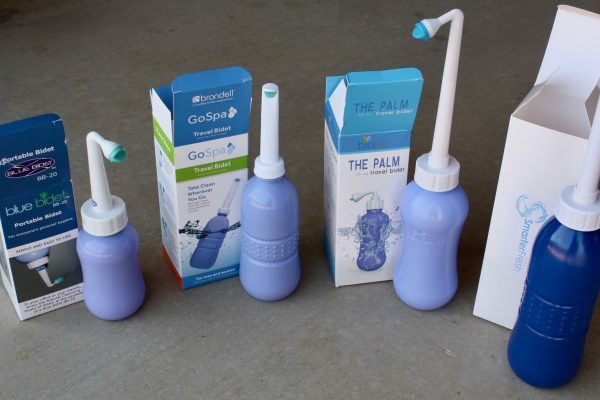 Interested to learn more about this cold water only attachment? 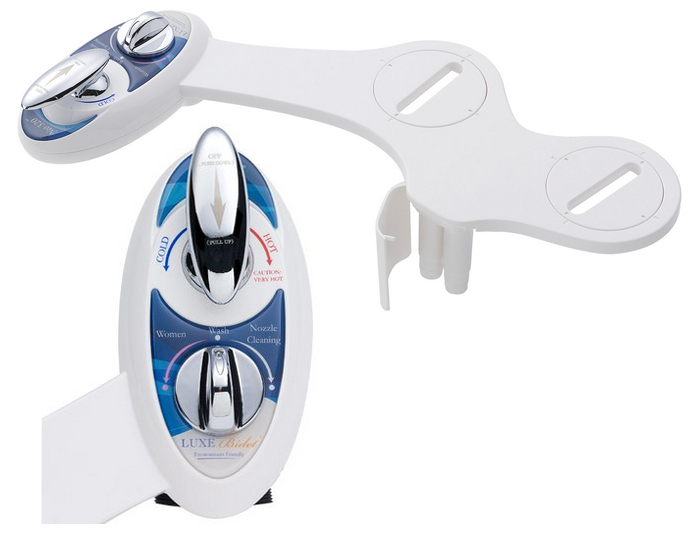 Here’s how the Elite3 compares against the BB-70 – Bio Bidet’s other entry-level attachment. Fine as the Bio Bidet Elite 3 is for a low-cost entry-level bidet attachment, the Luxe Bidet Neo 320 excels it in a few ways. The most obvious is the Neo 320’s ability to provide both warm and cold water. That’s relatively less common on a bidet attachment, and it fully justifies the somewhat higher price. You don’t have to live in a cold climate to appreciate that comforting feeling. 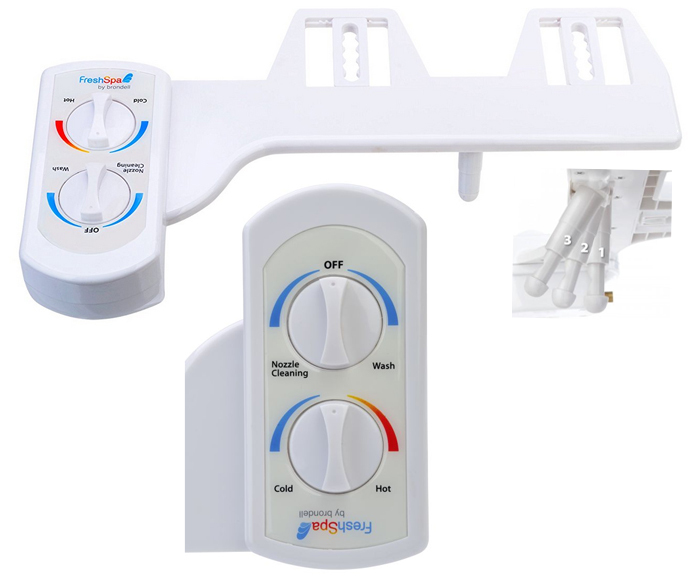 The temperature is easily adjustable, though you have to consider how long it takes warm water to reach the device. Just as with your faucet, it isn’t necessarily instantaneous. Some users install a special “instant hot water” unit under the sink to resolve that issue. The self-cleaning dual nozzles are, as always, very much appreciated. For me, it worked fine. The controls do allow you to change the angle using the Wash / Women dial, so it should accommodate most users. The nozzles retract out of the way when not in use. The Neo 320 also houses a nozzle guard to increase the ease-of-maintenance level even more. The whole thing is done here with fine quality parts, for the most part. The valve is made of both brass and ceramic, materials usually reserved for high-quality faucets. Unfortunately, the T-adapter for the cold water connection is plastic. It’s hard to say whether it will leak in the future, though it’s held up well for more than a year in regular use. Interested to learn more about the other Luxe Bidet attachments? Here’s how the Neo320 compares against the other bidet attachments from Luxe Bidet. Like the Neo 320, the Brondell FSW-20 offers both a cold and hot water connection. The dials for both pressure and temperature adjustment are easy to reach, situated just to the side. Like most, they’re plastic but the ABS seems strong and dials turn smoothly. They don’t feel cheap. The connectors used for installation are all fine quality material, however. The T-valve connector is made of brass for both cold and hot water. The braided hose is made of metal, not plastic, so it will probably outlive your bidet. The color coding makes it nearly impossible to make a mistake on the temperature adjustment, though of course you’ll quickly remember without looking which way is which on both the temp and pressure settings. By the way, that pressure setting turns from “practically unnoticeable” to “wow, that’s strong”. No worries finding one that suits every person’s comfort level. The adjustable self-cleaning single spray nozzle lets you aim at any of three positions. Personally, I’d look for one that was continuously variable to any angle from front to back, within a reasonable limit. This isn’t bad. Most users will find a setting that suits them, at least if they’re prepared to move a little themselves. Interested to learn more about the other Brondell attachments? Here’s how the FSW-20 compares against the other Brondell attachment models. Is a bidet attachment for you? If you’re on a tight budget, it’s definitely an option to consider. If you can’t without the absence of some features like warm air drying, deodorizer, automatic seat raising/lowering, and others – you might want to “upgrade” to a bidet seat. Only you can say for sure.